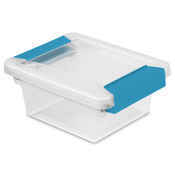 Sterilite Clip Boxes are great when used together or apart. With several sizes available, you can stack these modular Sterilite Clip Boxes on top of each other to really maximize space. The lids are held secure and tight with the clasping latches, or "clips", so you don't have to worry about stuff falling out of your clip boxes. 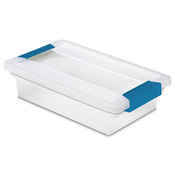 All of the Sterilite Clip Boxes are clear so you can easily so what is stored inside, even when they are stacked. With all of the available sizes, you can organize just about anything from tiny craft pieces to large books. 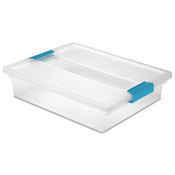 Get organized today with the perfect Sterilite Clip Box from Just Plastic Boxes and save big. 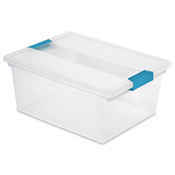 Items available : Sterilite Mini Clip Box, Sterilite Small Clip Box, Sterilite Medium Clip Box, Sterilite Large Clip Box and the Sterilite Deep Clip Box. 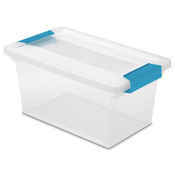 A Sterilite Clip Box may also be referred to as a Sterilite latch storage box as the clips are actually hinged latches attached to the box that latch onto the lid. Sterilite will change the color of the latches from time to time so be sure to check the product's primary photo and description for current color option.